In 1934, the historian of the French Revolution Georges Lefebvre gave a talk on “Revolutionary Crowds” (“Les foules révolutionnaires”). Looking back on the book he had published two years before, The Great Fear of 1789 – a book which had required more than fifteen years of scrupulous archival research –, he recognized that Le Bon’s Psychology of Crowds had been an essential source of inspiration. However, Lefebvre stopped short of paying an actual tribute to Le Bon: if Le Bon had truly opened a new field of inquiry by introducing the concept of crowd to the history of the French Revolution, his contribution remained “confused and superficial,” and he had clearly not succeeded in “clarifying” the concept itself. In a sense, Le Bon’s contribution remained too theoretical, as he was more interested in “a certain conception of psychological phenomena” than in actual crowds. While it would certainly be a bit exaggerated to say that Lefebvre “applied” Le Bon’s concept of the crowd, as Moscovici claimed in his The Age of the Crowd (1981: 84), it is nonetheless true that some of Le Bon’s ideas permeated Lefebvre’s historical study. 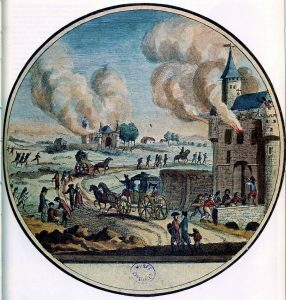 Peasants Burning Castles During the Great Fear of 1789: Riff-Raff or Crowd Mind? But first, what was the Great Fear (la Grande Peur) of 1789? 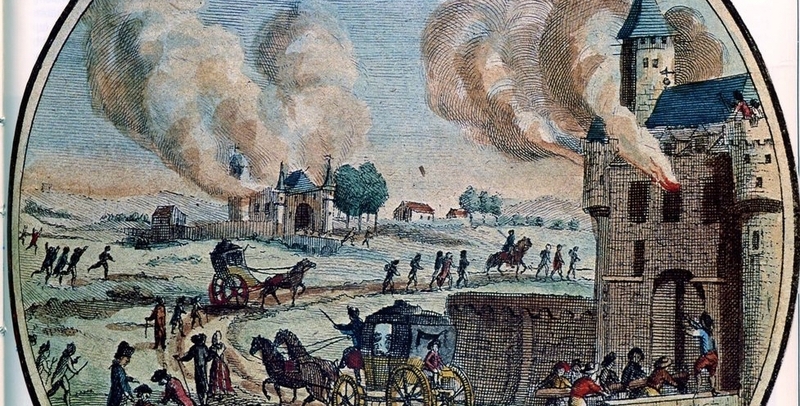 According to most historians, it was a general “panic” that took place in France in the second half of the month of July, 1789. While rumors that “brigands”, tramps and other stray people had always been frequent in rural France, especially near harvesting time, this time, the rumor escalated to extreme alarm. “Before, it was just possible, and feared, that brigands were coming; but this time, it was certain, they were here, one could see and hear them,” writes Lefebvre. Some peasants just ran away out of fear, others assembled, took arms, rang the warning bells, and went along to confront the assailants. Instead of staying localized, as was usually the case, the panic propagated quickly to vast regions of the country, thus creating new evidence and reasons for terror. In some regions, castles and manor houses were attacked, because of the belief in an aristocratic conspiracy (although its importance has been relativized by more recent studies, see Tackett, 2004). Ultimately, the abolition of the feudal system on the night of August, 4 can be seen as a response to these events and to rural unrest in general. Against Taine, who in his Les Origines de la France contemporaine saw the Great Fear as another expression of the violence and irrationality of crowds made of riff-raff, Lefebvre attempted to understand the reasons for the episodes of panic. On top of providing an extraordinarily precise account of the propagation of the Great Fear, what he wanted to do was to enter into the minds, the imaginary, or mentality (mentalité) of French peasants at the wake of the Revolution – an imaginary which was itself predicated on specific socio-economic conditions. In his book, he offered a wide-ranging picture of the situation of rural France in 1789, tying the events to the food shortage of 1788, to ancestral suspicions of vagrant people, to the fear of an aristocratic conspiracy and to the rancor against the feudal system. He also explained how certain smaller panics occurred before July 1789, anticipating and paving the way for a more general deflagration. For the founders of the Annales, Marc Bloch and Lucien Febvre, who enthusiastically reviewed the work, Lefebvre had shown how the Great Fear was “a symptom [which revealed] the state of the social body” (Bloch, 1933) and how one could grasp the “deforming labor of imagination” (Febvre, 1933). Our conscious acts are the outcome of an unconscious substratum created in the mind in the main by hereditary influences. This substratum consists of the innumerable common characteristics handed down from generation to generation, which constitute the genius of a race. […] Men most unlike in the matter of their intelligence possess instincts, passions, and feelings that are very similar. In the case of every thing that belongs to the realm of sentiment – religion, politics, morality, the affections and antipathies, &c. – the most eminent men seldom surpass the standard of the most ordinary individuals. According to Le Bon, when people were united in a crowd, it is this unconscious substratum that expressed itself in the collective mind. If, of course, Lefebvre was not using the same terms as Le Bon, his inquiry into the mentalité of the French peasant at the eve of the Revolution can be read as an attempt at penetrating the “unconscious substratum” that gives rise to collective behavior. There are crowds of every kind, publics of every kind; each of them has its own way of reacting. One should distinguish them, find some way to observe objectively how they behave, search for the conditions under which they vary. But these specific and precise researches are heading in an altogether different way than that of the vague interpsychology. A typology of the crowds – this is exactly what Lefebvre proposed in “Revolutionary Crowds,” where he distinguished between pure crowds or simple aggregates, semi-voluntary aggregates and what he called “gatherings.” According to Lefebvre, the only relevant question was the following: how do crowds (simple aggregates) turn into revolutionary gatherings? His answer was very Durkheimian: individuals contained in a simple aggregate always antecedently belong to society, so that they share a “collective mentality” which orients their actions, thoughts, and representations. These writers imagine they are stating a weighty truth when they assert, for instance, that languages and religions are collective productions: that crowds, without a leader, constructed Greek, Sanskrit, and Hebrew, as well as Buddhism and Christianity, and that the formations and transformations of society are always to be explained by the coercive action of the group upon its individual members […], rather than by the suggestive and contagious influence of certain select individuals upon the group as a whole. In reality, such explanations are quite illusory, and their authors fail to perceive that, in thus postulating a collective force, which implies the conformity of millions of men acting together under certain relations, they overlook the greatest difficulty, namely, the problem of explaining how such a general assimilation could ever have taken place. For Le Bon and Tarde, crowds represented “the first degree of social aggregation” (Tarde, 1898b). Instead of being seen as degenerate decompositions of existing social structures, they were to be thought as basic forms of sociality – which would eventually evolve into other, more organized, more differentiated groups, with their specific rules, hierarchies, and ethos. And this – the elementary, unmediated, transient and non-institutional character of crowds – is certainly very appealing for the contemporary advocates of crowdsourcing. March Bloch, “L’erreur collective de la Grande Peur comme symptôme d’un état social,” Annales d’histoire économique et sociale, vol. 5, n. 21, 1933, pp. 301-304. Christian Borch, The Politics of Crowds. An Alternative History of Sociology, Cambridge: Cambridge University Press, 2012. Lucien Febvre, “Une gigantesque fausse nouvelle : la Grande Peur de juillet 89,” Revue de synthèse historique, vol. 5, n. 2, pp. 7-15. Gustave Le Bon, Psychologie des foules, Paris: Alcan, 1895 (translated as The Crowd. A Study of the Popular Mind, New York: Macmillan, 1896). Georges Lefebvre, La grande peur de 1789, Paris: Armand Colin, 1932 (translated as The Great Fear of 1789: Rural Panic in Revolutionary France, New York: Pantheon Books, 1973). Georges Lefebvre, “Les foules révolutionnaires,” Annales historiques de la Révolution française, 11e année, n. 61, 1934, pp. 1-26. Serge Moscovici, L’âge des foules, Paris: Fayard, 1981 (translated as The Age of the Crowd. A Historical Treatise on Mass Psychology, Cambridge: Cambrdge University Press, 1985). Jacques Revel, “Présentation,” in Georges Lefebvre, La grande peur de 1789, Paris: Armand Colin, 1988, pp. 7-23. Timothy Tackett, “La Grande Peur et le complot aristocratique sous la Révolution française,” Annales historiques de la Révolution française, n. 335, 2004, pp. 1-17. Gabriel Tarde, Les lois sociales : esquisse d’une sociologie, Paris: Alcan, 1898a (translated as Social Laws: An Outline of Sociology, New York: Macmillan, 1899). Gabriel Tarde, “Le public et la foule,” Revue de Paris, 1898b, pp. 287-306 (July 15) and pp. 615-635 (August 1).